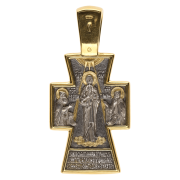 This cross is dedicated to the male Monastery of the Holy Transfiguration in Valaam and has been created with the monastery’s blessing. 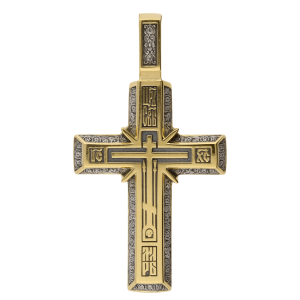 Its shape is characteristic for crosses from the Russian North, where the horizontal bar is rectangular, while the vertical one widens upwards and downwards from the center. 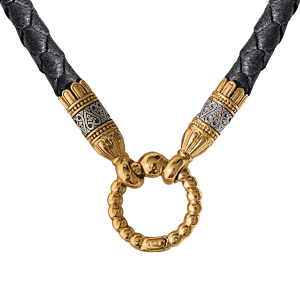 Such a shape, given the active and pronounced vertical line, serves to symbolically illustrate the connection between the earth and the heavens. 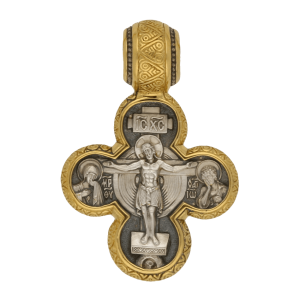 In addition, having a large area, it is conducive to depicting various iconographic images on the cross, which may help to specify and elaborate on this connection. The main semantic focal point of the cross is the icon of the Transfiguration, which occupies the entire front. At the top of the cross there is an inscription in Church Slavonic: преwбражeніе гDне (“the transfiguration of the Lord”). Of course, this choice of iconography, as opposed to the traditional Crucifixion, was determined by the name of the Valaam Monastery, whose main altar was consecrated to honor the feast of the Transfiguration. But this is not the only reason. When placed in on the cross, the icon of the Transfiguration in itself turns out to have a cruciform composition, and it is clear that the Transfiguration speaks to us about the Cross, but a Cross that “already radiates the light of the Easter morning”. This composition helps us gain a better understanding of the deep connection between the two events chronicled in the Gospels – the Transfiguration and the Crucifixion. The Transfiguration of Christ on Mount Tabor occurred forty days before His crucifixion. The purpose of the Transfiguration was to fortify the disciples’ faith in Christ as the Son of God, so that it did not waver during the suffering of the Savior on the Cross. The kontakion read during the feast says: “… so that, in seeing You being crucified, they shall see voluntary suffering and shall preach to the world that You are the true Light of the Father”. The prophets Moses and Elijah, who appeared at that moment, also spoke about the Passion of Christ (“Who appeared in glory, and spake of his decease which he should accomplish at Jerusalem” (Luke 9:31)). The Transfiguration is celebrated on 6 (19) August, forty days before the feast of the Exaltation of the Holy Cross, which takes place on 14 (27) September and, in effect, corresponds to Good Friday. This deviation from the actual chronology of the Gospel is explained by the undesirability of a solemn celebration falling onto the period of Lent. For us, the anthropological and soteriological meaning of the two events described in the Gospel is particularly important. According to the teaching of the Holy Fathers, the Crucifixion and the Cross is the path toward our salvation. It is not enough to stay close to Christ as He is crucified and to empathize with Him emotionally; one must be crucified alongside Him. Christ’s Transfiguration shows our purpose – the deification of human nature. “God was man for a time, and turns man into God”. The only difference is that, with human beings, this is done by grace. 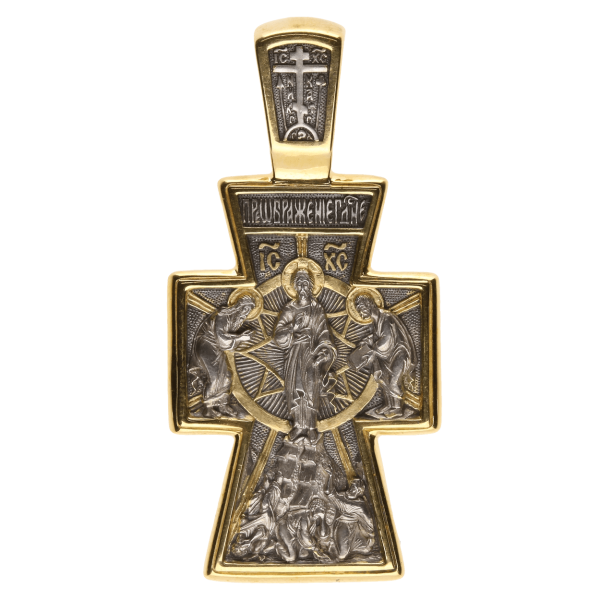 We know that the cross pendant invariably serves as a symbol of Christ and His salvific sacrifice, as well as a symbol of our own personal cross, regardless of whether or not there is a Crucifix (on our item, the idea of the Crucifixion is given additional emphasis through the Calvary Cross at the front of the top part). On the other hand, when the Transfiguration is depicted on a cross pendant, it points at the final goal that awaits us if we diligently carry our own cross. It should not deceive us by obscuring or belittling the Crucifixion, but, instead, should provide us with hope and comfort on our difficult path, as was the case once with the Apostles. St. Maximus the Confessor teaches that Christ reveals Himself to us in different ways. To beginners, He shows Himself as a servant, but those who have ascended to the spiritual heights and gained the ability to contemplate the Divine see Him “in the image of God”. He also defines the three stages in the spiritual ascent of a person onto Mount Tabor: purification, illumination and deification. For the Catholic Church, the pinnacle of holiness are the stigmata resulting from prolonged meditation before the Crucifix, that is, feeling one with Christ and co-experiencing His Passion from an emotional and fleshly perspective; but Orthodox saints are “gods by grace”, partakers of the Divine Light. The possibility of such deification is enshrined in the dogmatic teaching of the Orthodox Church on the Tabor light, which is described as “the uncreated, unmade light that emanates from the Divine itself as the rays of radiant Grace are pouring forth from the Holy Trinity, enlightening the world”. This teaching was based on an ancient monastic spiritual practice known as hesychasm (from the Greek Ησυχια, meaning “silence”). Hesychasm reached the height of its development in the 14th century in the monasteries on Mount Athos. It is worth noting that the top of Mount Athos is crowned by a church dedicated to the Transfiguration; in other words, Mount Athos has a spiritual meaning and is conceptualized as a second Tabor. The reverse develops the idea of the Valaam monastery as a place blessed by God’s grace. As with Mount Athos, Valaam represents Tabor and the Transfiguration. On the back of the cross one can see those who partook of the divine light on Mount Tabor. In the center there is Our Lady of Valaam, while the horizontal bar depicts the founders of the monastery, Saints Sergius and Herman of Valaam, who are shown down to their knees. The upper part of the cross depicts the celestial sphere with three beams of light coming down onto the Theotokos and the saints. 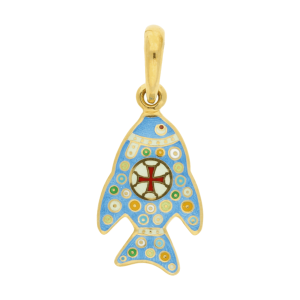 They serve as a symbol of the uncreated light of Tabor, which has a trinitary nature. This compositional solution is an illustration to the traditional inscription on the scroll of St. Herman (“we, the Orthodox, praise the light of the Three Suns and worship the indivisible Trinity”), as well as the troparion read during the feast of the Transfiguration of Christ, which is written at the bottom of the cross: “Да возсіsетъ и3 нaмъ грЁшнымъ свётъ тв0й присносyщный мл7твами бцdы. 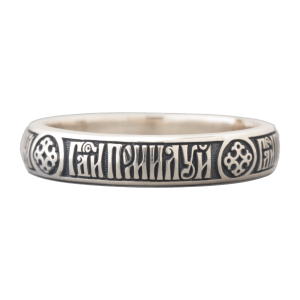 Свэтодaвче, слава тебЁ” (“May your ever-existing light shine upon us sinners by the prayers of the Theotokos, glory be to You, Giver of Light”). Our Lady of Valaam was revealed as a miraculous icon in the male Monastery of the Holy Transfiguration 1897. 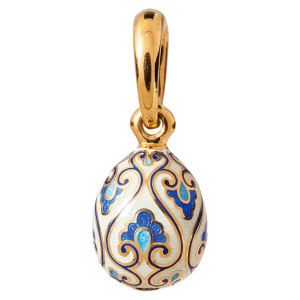 This revelation is connected to the spiritual witness of the Blessed Virgin Mary about providing Her cover (or protection) to Valaam as the Northern Athos. The icon was painted in 1877 by the Valaam monk Alypy according to the iconographic tradition that existed on Mount Athos in the late 19th century. At present, the miraculous icon is at the Transfiguration Cathedral of the New Valaam monastery in Finland. Valaam has a revered copy of the icon, which was created by the monks in 1900. The feast of the icon is celebrated on 1 (14) July. The information on the lives of St. Sergius and St. Herman is very scarce and contradictory, since the monastery chronicles were destroyed during the numerous devastating wars and invasions. Oral tradition tells us that monastic life began on Valaam as early as the reign of Princess Olga, and that the holy founders of the monastery were Greek monks. Written sources of the late 19th century state that the holy monks Sergius and Herman lived in the 14th century. What raises no doubt is the righteousness and spiritual accomplishments of these holy ascetics, who acquired the grace of the divine light and, by its means, enlightened the peoples of Karelia and the Russian north, as well as the monks’ prayers and the many miracles they manifested at the prayers of the faithful. The memory of St. Sergius and St. Herman is celebreated on 28 June (11 July), on 11 (24) September and in the third week after the Pentecost along with the saints of Novgorod. 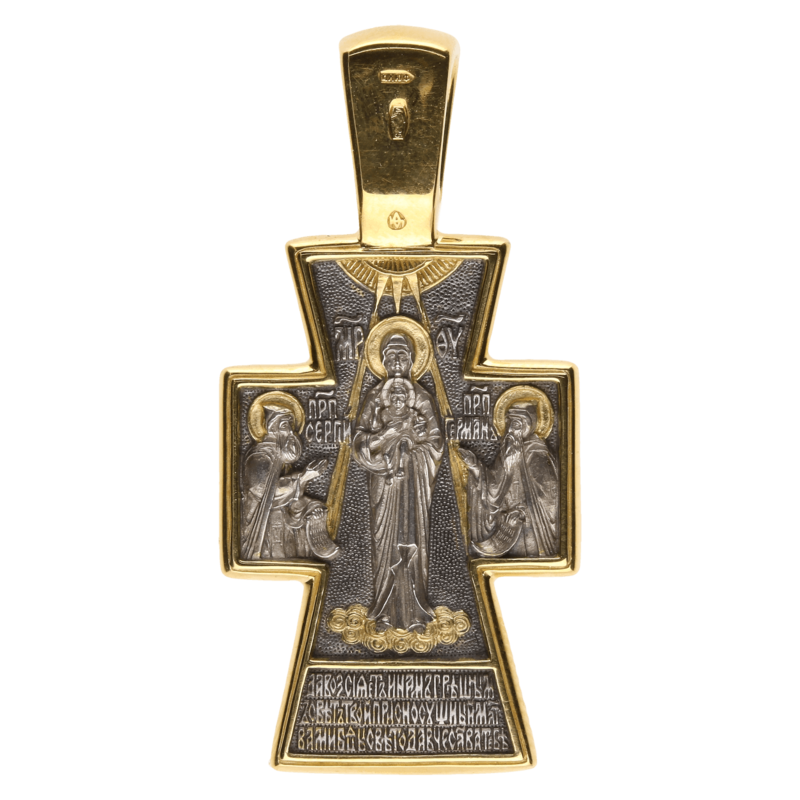 Be the first to review “Cross pendant “VALAAM CROSS”” Click here to cancel reply. Нательный крест посвящен Спасо-Преображен­скому Ва­ла­ам­­­скому мужскому мона­стырю и выполнен по благо­словению обители. Он имеет форму, характерную для крестов Русского Севера, где вертикальная балка расширяется от центра вверх и вниз, а горизонталь­ная – прямоугольна. Такая фор­ма, с активной и ярко выраженной вертикалью, символически пока­зы­вает связь земного с небесным. Кроме того, отличаясь большой площадью, она благоприятствует размещению в поле креста ико­нографических изображений, рас­кры­вающих эту связь в конкретном смысле. Главным смысловым цент­ром креста является икона «Преображение Господне», за­ни­­мающая всю его лицевую сторону. В верхней части креста присутствует надпись на церковно-славянском языке: преwбражeніе гDне. Такой выбор иконографии вместо традиционного Распятия, конечно, определило название Валаамского мона­сты­ря, главный престол которого освящен в честь праздника Преображения Господня. Но не только это. В поле креста проявляет­ся крестообразность композиции иконы «Преображение», и становится ясно, что Преображение возвещает нам о Кресте, но этот «Крест уже источает свет Пасхаль­ного утра». Такая композиция помогает лучше понять глубокую связь двух евангельских событий – Преображения и Распятия. Преображение Христа на горе Фавор произошло за сорок дней до Его распятия. Цель Преображения состояла в утверждении учеников в вере в Христа как Сына Божия, чтобы она не поколебалась в момент крестных страданий Спасителя. В кондаке праздника говорится: «…да егда Тя узрят распинаема, страдание убо уразумеют вольное, мирови же проповедят, яко Ты еси во истину Отчие сияние». О страстях Христовых говорят и явившиеся в тот момент пророки Моисей и Илия. «Явившись во славе, они говорили об исходе Его, который Ему надлежало совершить в Иерусалиме» (Лк. 9.31). Празднование Преображения установлено 6 (19) августа за сорок дней до праздника Воздвижения Честного Животворящего Креста Господня (14 (27) сентября), который, по сути, соответствует Великой Пятнице. Такое отклонение от реальной евангель­ской хронологии объясняется нежелательностью со­впадения торжественного празд­ника с пе­риодом Великого поста. Для нас особое значение имеет антро­пологический и сотериологи­ческий смысл двух евангельских событий. По учению Святых Отцов, Распятие и Крест – это путь нашего спасения. Мало находиться рядом с распятым Христом, душевно сопереживая Ему, необходимо со-распинаться с Ним. А Преображение Христа показывает цель нашей жизни – обожение человеческой природы. «Бог – человек бывает, да человека Богом соделает». С той разницей, что че­ловеку это совершается по благодати. Мы знаем, что нательный крест всегда является символом Христа и Его спасительной жертвы, а также – символом нашего крестного пути, независимо от того, присутствует на нем Распятие или нет. (В нашей работе дополнительно выделяет идею Распятия об­раз Голгофского Креста на лицевой стороне оглавия.) «Преображение» же на нательном кресте указывает цель крестного пути. Оно не должно прельщать нас, умаляя Распятие, но и, как когда-то апостолам, должно давать надежду и утешение на трудном крестном пути. Святой Максим Исповедник учит, что Христос открывается всем по-разному, на­чинающим Он открывается в образе раба, а тем, кто восходит на гору боговидения, Он является «в образе Бога». Также он определяет и три степени духовного восхождения человека на гору Фавор: очищение, просвещение и обожение. И если в католической Церкви вершиной святости являются стигматы, полученные в результате медитаций перед Распятием, то есть душевно-плотское единство со страстями Христа, то православные свя­тые – это «боги по благодати», причастники Божественного света. Возможность такого обожения закреплена в догматическом уче­нии Православной Церкви о Фаворском свете, который «есть свет несозданный, несотворенный, но является излучением Самого Божества, светолучным излия­нием Благодати Пресвятой Троицы, просвещаю­щий мир». Это учение было основано на древней практике монашеского духовного дела­ния – исихазме (греч. Ησυχια – безмолвие). Наибольшее развитие исихазм получил в XIV в. в монастырях святой горы Афон. Знаменательно, что вершина Афона венчает­ся храмом Преображения, то есть гора Афон духовна и осмысляется как Фавор. Оборотная сторона креста рас­­­кры­вает идею Валаамского монас­тыря как места присутствия Божией благодати. Как и в случае с Афоном, Валаам – образ Фавора, и образ Преобра­жения. На оборотной стороне представлены причастники Фаворского Божественного света. В центре креста – Валаамский образ Божией Матери, а на горизонтальной балке – поколенные фигуры святых основателей обители, преподобных Сергия и Германа Валаамских. В верхней части креста изображена небесная сфера, из которой на Богородицу и святых исходят три луча света, как символ нетварного Фаворского света, имеющего Троичную природу. Такое композиционное решение является иллюстрацией традиционной над­писи на свитке преподобного Германа: «Трисолнечный свет православно славим и нераздельной Троице покланяемся», а также слов тропаря к празднику «Преображение Господне», написанных в нижней части креста: «Да возсіsетъ и3 нaмъ грЁшнымъ свётъ тв0й присносyщный мл7твами бцdы. Свэтодaвче, слава тебЁ». Валаамский образ Божией Матери был явлен как чудотворный в Спасо-Пре­об­раженском мужском монастыре в 1897 г. С его явлением связывают духовное сви­детельство Богородицы о Ее Покрове Валааму как Северному Афону. Икона была написана в 1877 г. Валаамским монахом Алипием в иконописной традиции Афона конца XIX в.
В настоящее время чудотворный образ находится в Преображенском соборе мо­настыря Новый Валаам в Финляндии. На Валааме же находится чтимый список иконы, созданный монахами в 1900 г. Празд­нование иконе совершается 01 (14) июля. Сведения о житии преподобных Сергия и Германа очень скудны и противоречивы, так как монастырские летописи погибли во вре­мя многочисленных разруши­тельных войн и нашествий. Устное Предание говорит о начале иночес­кой жизни на Валааме еще при княгине Ольге и что святые основате­ли обители были греческими монахами. Письменные источники конца XIX в. со­общают, что преподобные Сергий и Герман жили в XIV в.
Šis kryžius sukurtas Valaamo Šventojo Atsimainymo vyrų vienuolyno garbei bei su jo palaiminimu. Horizontali sija yra stačiakampio formos, o vertikali viršuje ir apačioje išsiplečia. Visą priekinę dalį užima Atsimainymo ikona. Šį pasirinkimą nulėmė Valaamo vienuolyno pavadinimas bei tai, kad jo pagrindinis altorius buvo pašventintas Atsimainymo šventės garbei. Priešingoje pusėje centre matyti Valaamo Dievo Motina, o šonuose, ant horizontalios sijos – vienuolyno įkūrėjai, šventieji Sergijus ir Hermanas, kurių figūros pavaizduotos ligi kelių. Viršutinė kryžiaus dalis vaizduoja dangiškąją sferą, iš kurios ant Dievo Motinos ir šventųjų nusileidžia trys šviesos spinduliai. Valaamo Dievo Motinos ikoną 19 a. pabaigoje nutapė vienuolis vardu Alipijus, o kiek vėliau ji buvo atskleista kaip stebuklinga Šventojo Atsimainymo vienuolyne, ryšium su Švč. Mergelės Marijos dvasiniu liudijimu apie tai, jog ji teiksianti savo dangą (apsaugą) Valaamo vienuolynui kaip šiaurės Atonui. Apatinėje kryžiaus dalyje išgraviruotas troparas, skaitomas Kristaus Atsimainymo šventės metu.